Though most visitors to Siena allowing only one day for sightseeing, I think this magical, historic city deserves at least an overnight. We visited Siena in late October during school break (sorry for the late post!) and stayed for two full days. 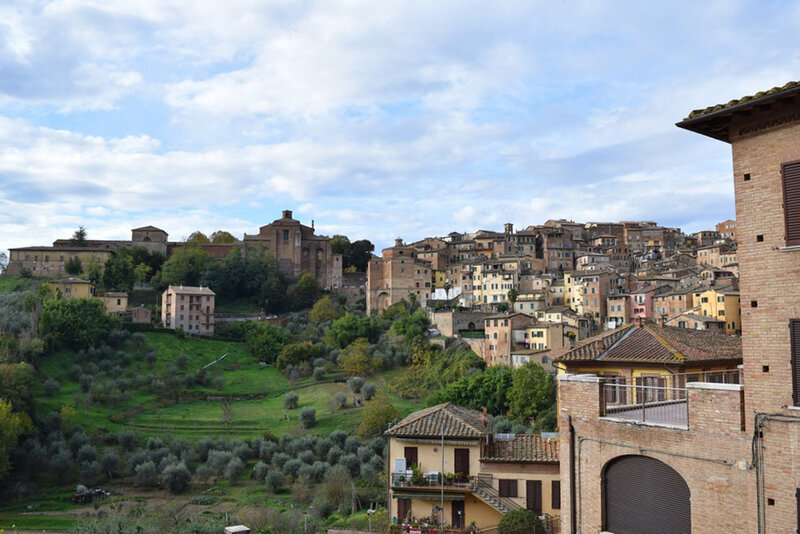 It was the perfect amount of time to experience Siena (and its great food) with a kid. Pick up a map from this Etsy shop* to remind you of your time in Tuscany. I have a similar map from Vilnius, and the quality is excellent. 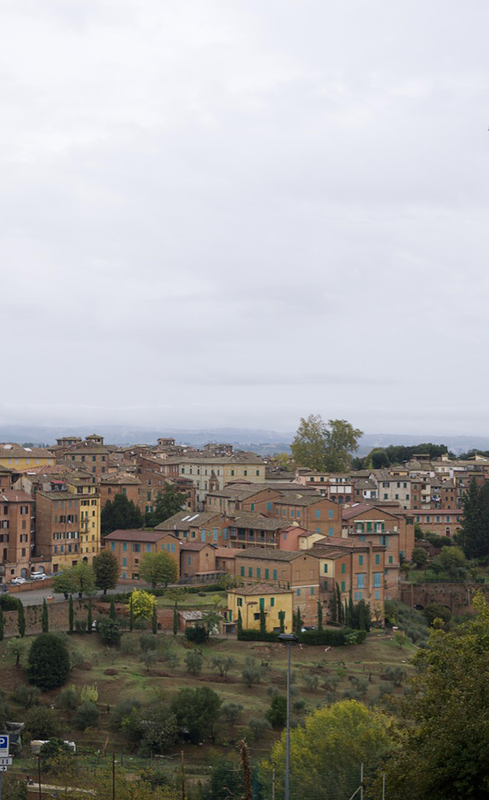 There are two easy and popular ways to reach Siena from Florence via public transport: bus and train. Traveling by train is more comfortable, so that is what we opted for to reach Siena. Trains leave Florence towards Siena approximately once per hour and cost about 6 euros. The train takes a bit under two hours to reach Siena from Florence. Remember that children travel free on the train up until the age of four, so don’t buy a ticket for your little one. There is no need to buy adult tickets in advance as the train is a local. 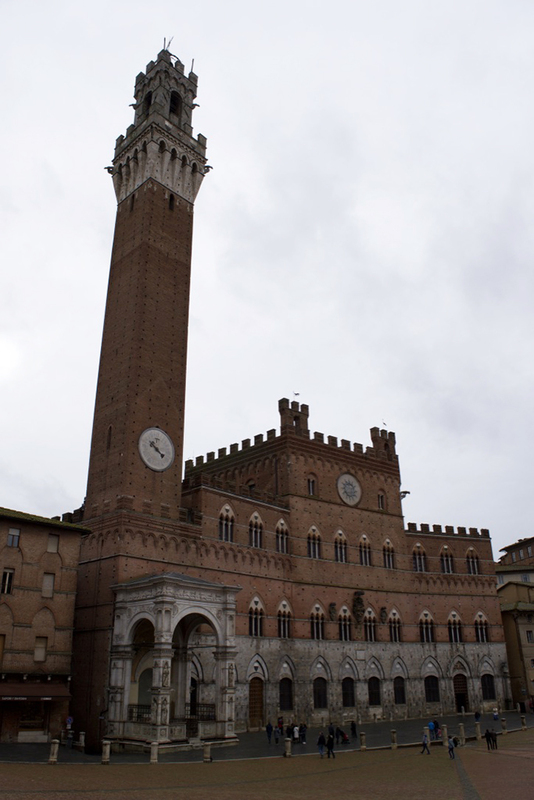 The train station is a bit outside of the historic city center in Siena, but it is very easy to reach. After arriving at the train station, following the signs pointing the way towards the mall across the street. Then, head to the top floor of the mall and exit through the clearly marked double doors, which lead to a series of escalators (no elevators are available here) that take you up to a street above. Once you arrive at the top of the escalators (less than 5 minutes), you can grab a map from the vending machine (or switch on your GPS on your phone). From the top of the escalators, it is about a 15 minute walk into the historic city center. If you are traveling with a stroller*, it will need to be folded and you’ll have to hold your child as you ascend the escalators to the street going to the historic center. Note that there is no elevator to the top. I’d also suggest packing light, so you aren’t lugging too much into the city center. 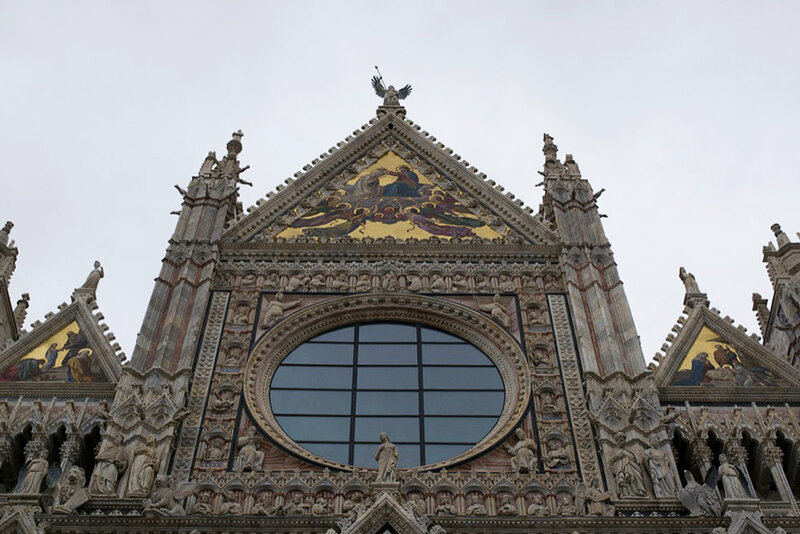 The Duomo di Siena was built in the 13th century and the exterior features the typical stripped design using marble that many of the cathedrals in Tuscany have. 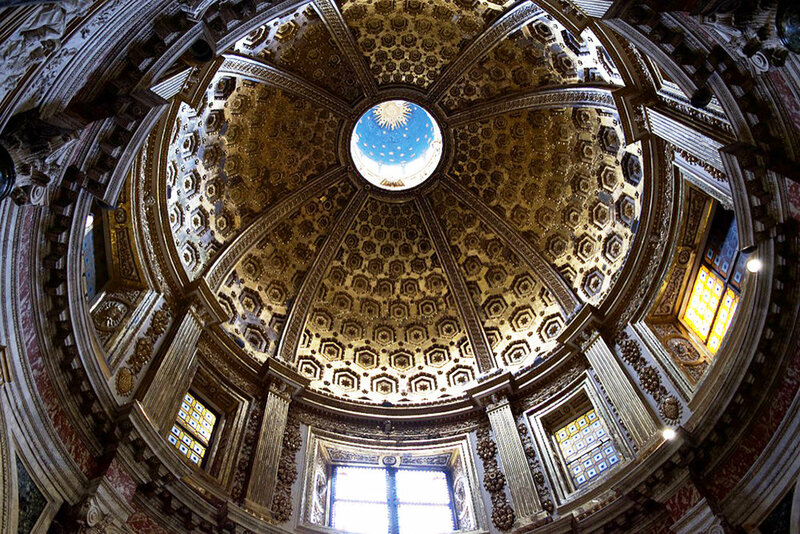 The bell tower and the cathedral are considered some of the best examples of Romanesque-Gothic architecture in Italy—and the beautiful details continue on the inside as well. One of the highlights of the inside of the Duomo di Siena are the She-wolf floor panel, which shows Siena as the center of the universe (i.e., the She-wolf) with other Italian cities surrounding her. You’ll find the She-wolf throughout the old part of the city and on two pillars flanking the cathedral, since she is the mother of Romulus and Remus; Remus’ son is credited with founding Siena. Another highlight of the cathedral is the Madona del Voto, a famous icon of the Madonna and Child. The Palio (see below) is dedicated to the Mary in this icon, and people from Siena and visitors from across the globe bring offerings of jewelry. You definitely won’t miss seeing this icon with the sheer amount of jewelry surrounding it. For me, the most stunning part of the Duomo di Siena was the Piccolomini LIbrary, which is covered with eye-catching frescoes. In short, the Duomo di Siena is the most beautiful church I’ve seen in Italy. Both Baby ISO and I were mezmorized by the mosaic floors, stripped marble interior, and intricate details throughout. Depending on the entry you choose, tickets are approximately 5 EUR (children are free) to enter the Duomo and Piccolomini Library. 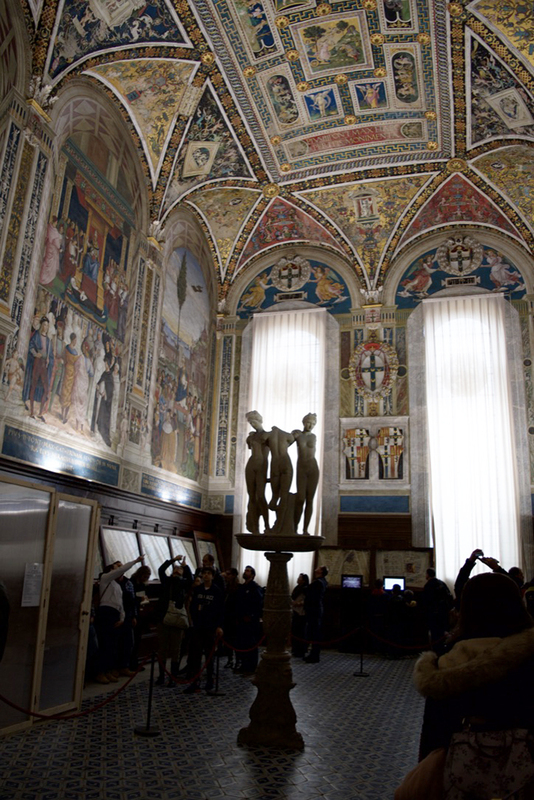 There is an additional fee to visit the Crypt, Baptristry, and Duomo Museum. We opted to visit only the cathedral and library, based on the attention span of our three-year-old. 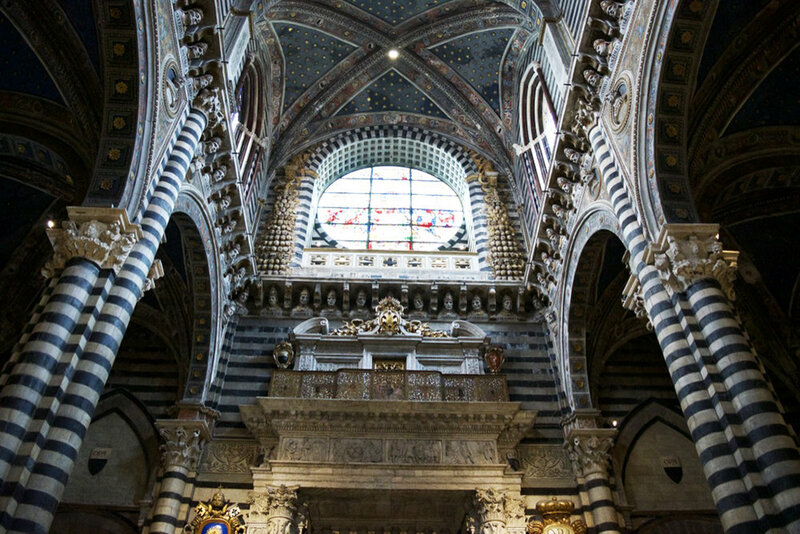 Guide books, like this one from Lonely Planet*, is actually really helpful for learning about the different parts of the church and the special meaning of the she wolf motif that you’ll see throughout the Duomo di Siena and in Siena in general. 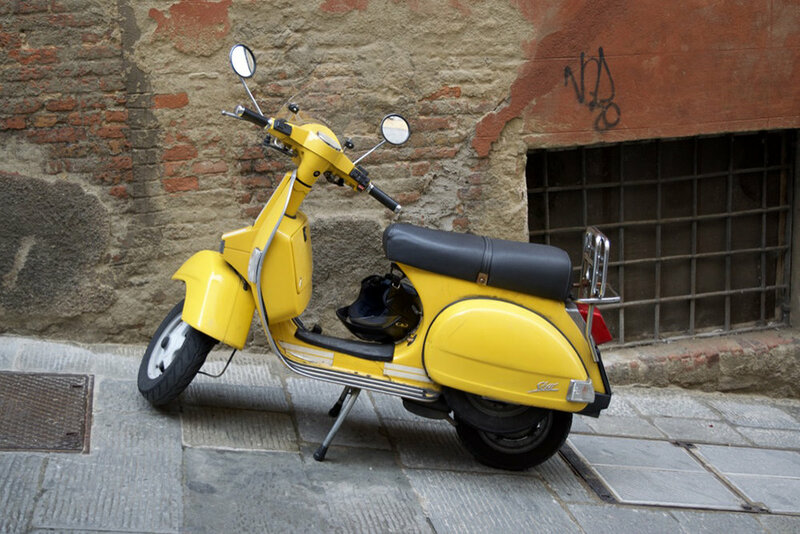 Piazza del Campo is another highlight of the city, with the colorful buildings, sloped piazza, civic museum, and the Fountain of Joy. Little restaurants, shops, and a Conad grocery store are also located along the Piazza del Campo. The coolest thing about the Piazza del Campo is that this is where the Palio—a yearly horse race that is an intense competition between the neighborhoods—is held each summer. My first reaction when I saw the piazza was how can they possibly race horses in this tiny, hilly piazza. Go and see it for yourself, and let me know if you can image a horse race! 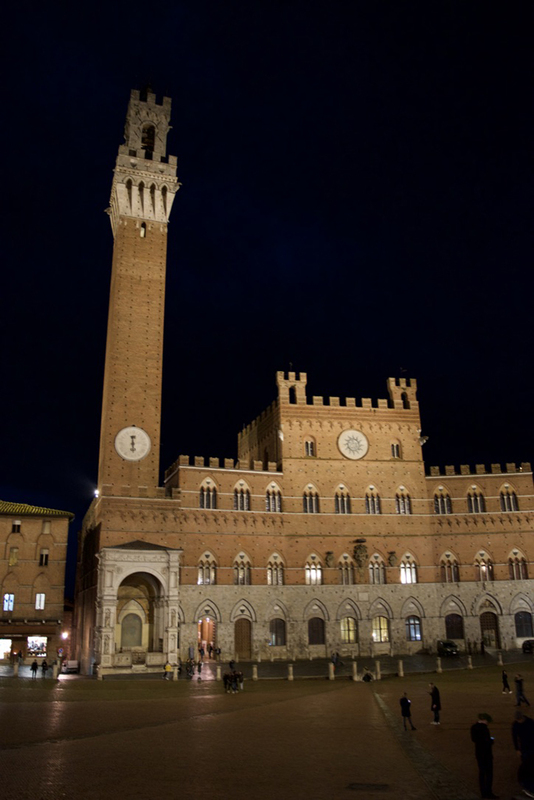 Siena’s known throughout Tuscany for its 17 traditional neighborhoods (contrade). Each neighborhood throughout the city has a specific mascot that is easy to spot, and would be really fun for older kids to keep an eye out for (learn more about the city’s mascots at this website). Below are photos of the tortoise contrade. We stayed in the tower neighborhood (elephant carrying a tower symbol), which is great for kids for its convenience to the piazza and for its fun, elephant themed public playground. These 17 contrade compete during the Palio for bragging rights on which neighborhood is the best, but the rivalry among the contrade is evident throughout the year. Keep an eye out for the flags, water fountains, plaques, and lights to figure out which contrade you are in. 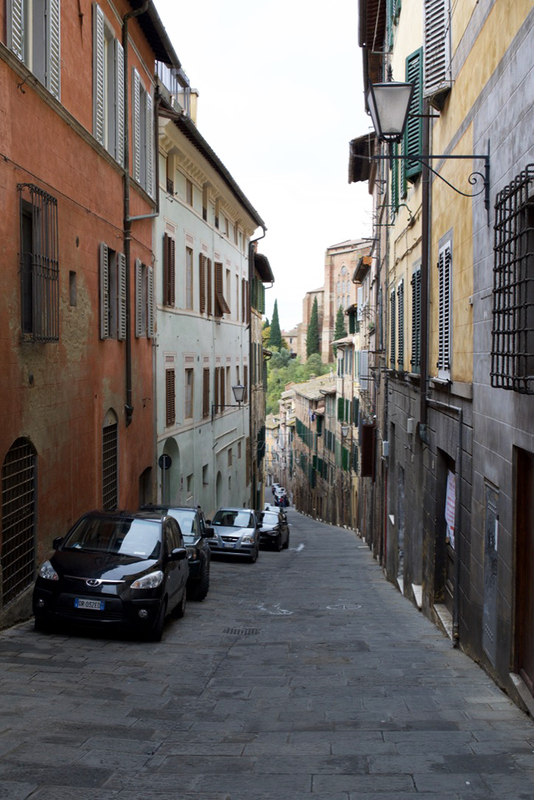 Outside of the major sites of Siena are winding streets, colorful buildings, smaller churches, and views of beautiful hills. Apparently, I was too busy eating to take any of my usual food photos, but the food highlights of Siena had to be the sweets and the cacio e pepe with pici pasta (fat spagetti with melty cheese and black pepper). Though there are several sweets local to Siena, my favorite were ricciarelli, which are cookies made from almond flower that are soft on the inside, crispy on the outside and covered in powdered sugar. These cookies come in either regular flavor or chocolate and can be found at Ninnini’s, which is incredibly popular and also have some packed as nice treats to take home from your trip. Note that if you are looking to have a good meal, you should make lunch and dinner reservations in advance. The two restaurants we wanted to eat at were completely booked the entire time we were visiting. Have you been to Siena? What would you add? Please note that links marked with an asterisk (*) are affiliates. This means that if you purchase something from one of this links, In Search Of might make a small commission at no cost to you. Thank you for supporting ISO.